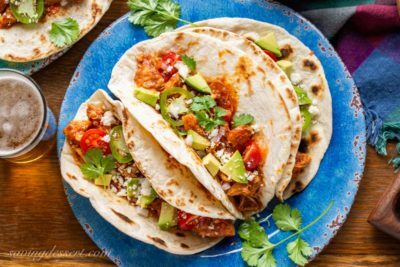 Smoky Chicken Tinga Tacos (tinga de pollo) – a flavorful Mexican dish made with fire roasted tomatoes, chipotle chilis in adobo sauce and tender, shredded chicken. Served as a topping for tostadas with a layer of refried beans, or as a filling for tacos, this delicious smoky chicken won’t get lost under layers and layers of toppings! 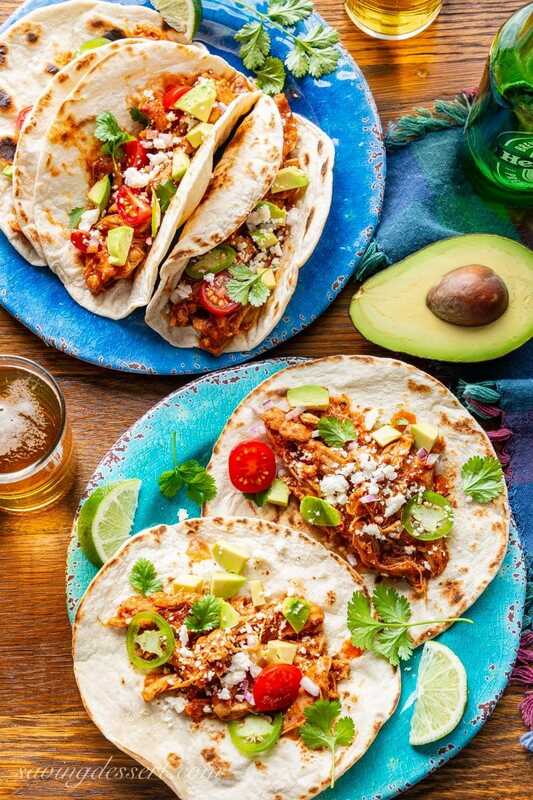 Taco Tuesday, Cinco de Mayo, family dinner or just because it’s the weekend, all perfect reasons to make these wonderful, flavorful tacos! Tinga is an amazing Mexican sauce with smokiness from the chipotle and adobo sauce and just a little heat. We’re not talking ‘burn your mouth, pass the milk’ kind-of heat. It’s more of an after burn, and more warm than hot. 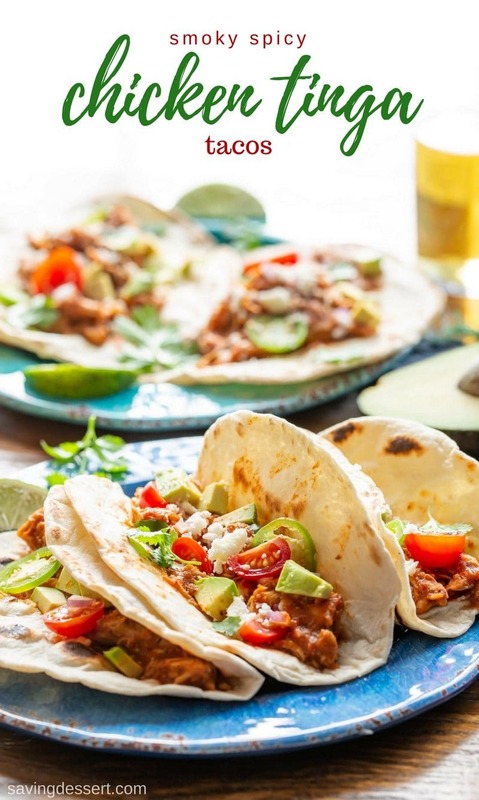 LOVE, love, love this smoky tomatoey chicken taco filling! 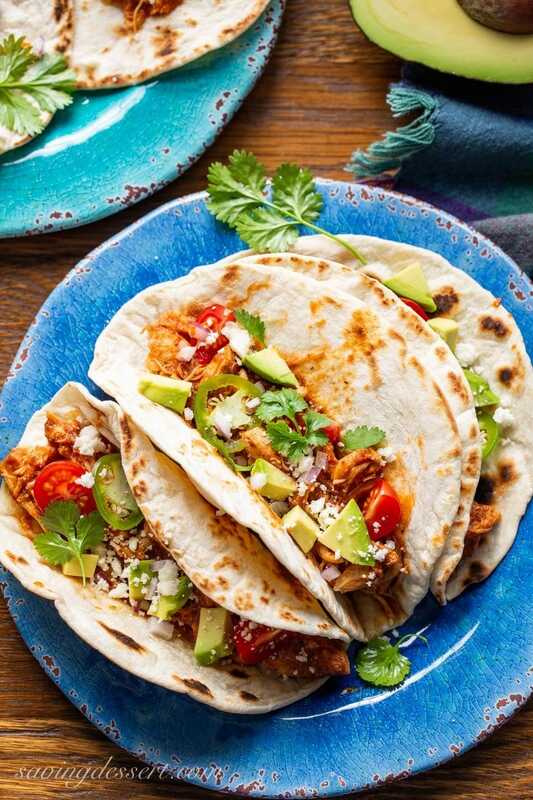 We serve our Chicken Tinga Tacos on small flour tortillas that have been toasted in a hot, dry skillet over medium-high heat. No butter or oil is needed, just watch them closely and turn after a minute or two. I adore the crispy pockets and bubbles, and love that they don’t fall apart when filled with this saucy, shredded chicken. Our favorite toppings include fresh sliced jalapeños, diced avocado, plenty of cilantro leaves, minced red onion and crumbled Cotija cheese. Grab a bottle of your favorite hot sauce and maybe some sour cream too! Make it a party and serve these tacos with our Easy Spanish Rice, and a bowl of Spicy Guacamole with chips. It’s the best guacamole I’ve ever had, and I’ve tried a lot. Just saying 🙂 It probably won’t hurt if you open a bottle or two of beer, or make a pitcher of these Frozen Strawberry Margaritas to go along with the guac. And finally, to put icing on the cake so to speak, try this easy make-ahead, super delicious, and wonderfully refreshing Margarita Pie with a Pretzel Crust. Boy … I must be in the mood for a party and it’s only Monday! I can eat this saucy chicken on plain lettuce and be a happy señorita. And that’s a low carb option too! I almost think the chicken gets better after blending overnight, so no worries if you want to cook ahead or freeze a big batch for later. Just go ahead and double the recipe, you won’t be sorry. Olé!!! NOTES from our KITCHEN: This recipe calls for 2 large canned chipotle chili peppers and 2 tablespoons of the adobo sauce. You can flash freeze the remaining canned peppers by laying them out seperately on a parchment lined baking sheet and top each pepper with a little of the remaining adobo sauce. Pop the whole pan in the freezer and once frozen, remove the peppers to a freezer safe plastic bag or container. You only need 1/2 cup of chicken broth for this recipe, so you will have leftovers. I use chicken broth about once a week to poach chicken breasts for salads and easy dinners. You can also freeze the chicken broth in 1/2 cup portions and you’ll be ready for the next batch of Chicken Tinga Tacos! Heat 1 tablespoon oil in a Dutch Oven over medium to medium-high heat until shimmering. Cook half the chicken thighs until brown on both sides, about 4-5 minutes per side. Remove the chicken to a large plate and continue cooking the remaining thighs. Reduce the heat to medium and add 1 tablespoon vegetable oil. Heat until shimmering and then add the onion. Cook until the onions start to brown, about 5 minutes. Add the garlic, cumin, oregano and the powdered chipotle chili pepper (if using) and cook for 1 minute or until fragrant. Add the can of fire roasted tomatoes, chicken broth, chipotle peppers, adobo sauce, and 1 teaspoon brown sugar. Bring to a boil, scraping the bottom of the Dutch oven to loosen any brown bits. Add the browned chicken to the pot, and reduce the heat to medium-low. Cover the Dutch oven and simmer for 10 minutes. Turn the chicken, cover and cook for another 20 minutes. Remove the chicken thighs from the sauce and set aside to cool slightly. Using an immersion blender, process the tomato sauce in the Dutch oven until smooth. (Carefully tilt the Dutch oven to one side to make it easier to process) If you don’t have an immersion blender, you can use a regular blender or food processor. Take care when pouring hot liquids into the blender carafe. Shred the chicken using two forks into bite size pieces and return to the sauce in the Dutch oven. Heat over medium-low, uncovered and stirring frequently, until the sauce is thickened and the chicken is coated, about 10 minutes. Add the lime juice, salt and pepper. Stir until blended. Serve and enjoy! Now that you’re in the mood for tacos, check out our favorite Creamy Taco Soup Recipe. It’s super healthy and loaded with all the taco flavors you love. We even have a Meatless Monday Taco Salad for a nice vegetarian option. And this summer, don’t miss these Sriracha Grilled Mahi Mahi Fish Tacos – boy are they good! For something a little different, I love these Taco Stuffed Peppers from Wine and Glue. And how about this creative Taco Pizza from A Mind “Full” Mom? Yummy stuff. I’m also going to try these Keto Taco Egg Muffins from All Day I Dream About Food – they look super delicious! I can’t wait to share this recipe with my son! He loves all things spicy and taco related! Looks so good, Tricia! Yeah! Hope he gives it a try – it’s so delicious!!! Mmmm, tacos! Love ’em! I mean, who doesn’t? You’ve really loaded these with flavor — SO GOOD! Thanks! Oh I hope you’ll try it Susan – so much flavor with very little effort! We love it. Thanks for stopping by! How appetizing on those beautiful plates!! Color is everything 🙂 Thanks Monique! It looks great, Tricia! 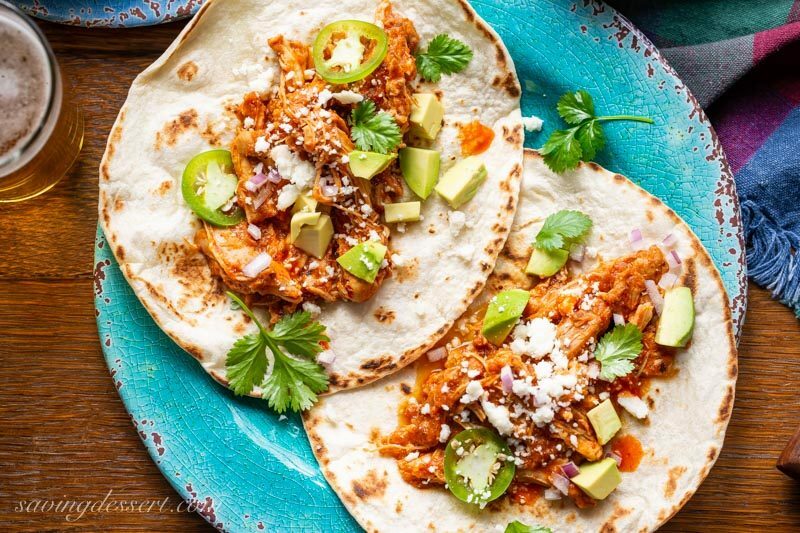 I recently made chicken tinga but have to try your version now. Everybody seems to like tacos. Love your colorful plates, perfect for tacos! We have these melamine plates around for the grandchildren to use during our monthly family dinner – haha – I got these at Pier One! I really need to shake up my taco game and this recipe sounds perfect! Not too “out there” where Bill will be rolling his eyes, but just a delicious change of pace! I love everything about these tacos Liz – and bet you all will too! Chicken tinga is a regular at our house! Such a great one and I have to tell you those plates! I have been wanting to buy them like forever so I think now you’ve convinced me. They are so pretty! Wow, this is a vibrant meal, right up my alley! How is it that I’ve never had tinga chicken? I’ve clearly been missing out ~ sharing and pinning! They look and sound fantastic Tricia and are a must try. Thanks Larry – they are so good! Well my Taco Tuesday is sorted! Love a little tinga in my tacos 🙂 Perfect! I really hope you try this recipe Jennifer – it’s so good and loaded with flavor. Have a terrific week! Please pass the whole plate over 🙂 I could devour the whole lot! Haha – I’m with you Angie – this is some good chicken! I’m ready to party with you Tricia! These tacos are so pretty and you givve so many great tips! Thanks!